Up until today all we had caught this fall season had been a couple of 30 lb. class stripers, a few 29 inch ones and a bunch of throwbacks. Overall it had been a very disappointing striper season, especially after how good it was last year but today that all changed. On Thursday’s trip we had only one striper all day caught on a bunker head so we decided it was time to change our tactics and it really paid off. We heard of large stripers being caught on live bait, jig, surface poppers and various deep running trolling lures all within 3 miles of the beach so it really was a no-brainer change up some and try some things to see how that might work out. On today’s trip we trolled, live spot-eels and jigs but trolling old fashioned tube lures that I have had in my striper arsenal going back 25-30 years when stripers first made their comeback in our local waters were the ticket. We tried live bait fishing with spot and eels at daybreak but this got very expensive as the dog sharks ate every bait we put down within about 10 seconds or less so we turned to trolling for the rest of the day. We ended up with a total of 16 stripers, a few gator size Blues plus a 23 inch Flounder that we painfully threw back. Great action, flat calm seas and nice warm weather added up to our best trip so far this season. 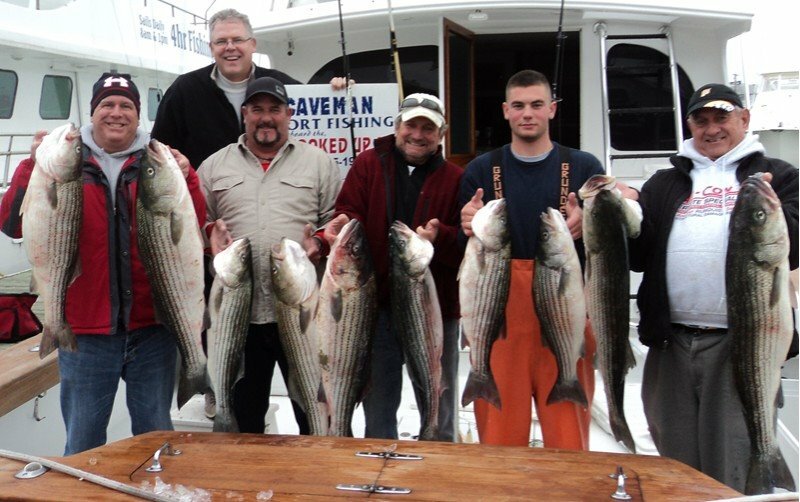 With the number of large stripers that have been caught the last few days it seems the fall run is finally happening in South Jersey and hopefully we will have great striper fishing throughout December like we did last season. Last year we ran our last chunking trip on December 27 and limited out in 6 hours fishing with frozen bunker so hopefully we will have great striper action right up to the holidays. We only have one date available (Dec 2) until December 9th but after that we have plenty of great dates available for those interested in booking a trip with us.